Mary Valastro (born Mary Tubito; aka Cake Boss Mom) was the mother of Buddy Valastro (born 1977) and the four of his siblings: Grace (1966), Maddalena (1967), Mary (1969), and Lisa (1974). During 2009-2012, Buddy Valastro’s mother has been regularly appearing on Buddy’s TLC reality show Cake Boss. Mary passed away on 22 June 2017 in New Jersey, United States. Mary died after a 5-year battle with Amyotrophic Lateral Sclerosis (ALS), surrounded by her adoring family. She was 69. Mary Tubito was born in 1948, in the historic city of Altamura, southern Italy. The future Cake Boss mom had seven siblings; her parents names were – Nicholas and Maddalena Tubito. When Mary was only six years old, her family decided to relocate to the US. The family settled in Hoboken, New Jersey. Buddy Valastro’s mother attended Public School No. 3, then Demarest Junior High School in Hoboken, NJ. Mary Valastro father worked as a docker, and her mother was busy with household chores. Mary helped her mom before and after school. When she was 12 years old, she met Bartolo “Buddy” Valastro, her future husband. Originally, Bartolo was from Lipari, an island north of Sicily. 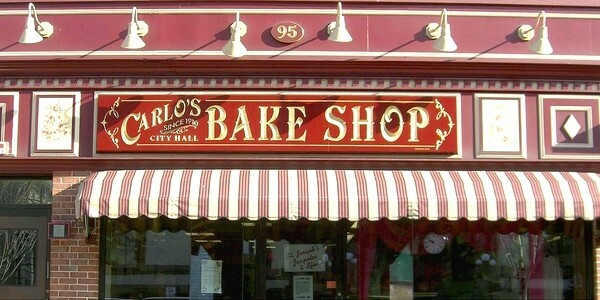 The couple purchased Carlo’s Bakery in 1964. They got married in 1965 (she was 16 years old). They built a successful business and had five children, all of whom work in the family’s baking business. In 1989, Carlo’s Bakery moved to its new home on Washington and First Street and started to become more popular day by day. The Valastro family business was flourishing, children matured and grandchildren were born. But in 1994, Buddy died of cancer at the age of 54. When her husband passed away, Cake Boss mother Mary was tempted to sell the business but never did. Instead, she became the owner of Carlo’s Bakery Company and continued the operation of the business. Later in life she married Giovanni Pinto, a professor and the publisher of L’Italico. Giovanni and Mary Pinto lived in Little Ferry, NJ. Mary had always been the family matriarch, a strong and compassionate woman. The current size of the Carlo’s Bakery Company is between $1 mil and $5 mil. The company employs under 25 people. In 2012, Buddy Valastro mother was diagnosed with a motor neuron disease – amyotrophic lateral sclerosis. This invariably fatal neurodegenerative disease affects the nerve cells responsible for controlling muscles. First her fingers started to feel weak. Mary thought it was carpal tunnel and had the surgery, which did not help. Weakness in her hands was increasing. She became really alarmed when her legs started to feel weak as well. At 64, Buddy Valastro’s mom Mary Valastro was diagnosed with ALS (Lou Gehrig’s disease) – a rapid degenerative nerve disease that leads to loss of muscle control. At the end of 2012, Mary fell and hit her head. She was taken to the Hoboken University Medical Centerl. She took at least two trips to Israel for stem cell treatments in order to slow down the ALS and did numerous other attempts to fight this deadly condition. As the years went on, Cake Boss mother became unable to walk across the street or button a shirt. I was a group effort to care for and support Mary Valastro Pinto. There was hardly anything else that doctors could do about this horrible disease, except try to make her comfortable. Mary appeared in numerous episodes of the TV Series Cake Boss, as Buddy’s Mom (herself). Due to her condition, she had to exit her son’s reality show Cake Boss. Even so, Cake Boss Buddy Valastro was saying that Mama Mary remained extremely energetic, and we hoped not to see a Mary Valastro obituary for many years to come. People with MND/ALS typically die from respiratory failure within 5 years of the symptoms onset; about 10% survive for over a decade. Unfortunately, Mary’s MND/ALS was a quick one. Mary Valastro died after a five-year battle; she was only 69. The funeral for Mary ‘Mama’ Valastro had gathered her family and friends at St. Joseph’s Church on Pavonia Avenue in Jersey City. On the day of the funeral, the city of Hoboken came to support the Cake Boss and his family with their tribute. “Her battle with ALS has ended, she is no longer suffering and I hope she’s dancing to ‘I Will Survive’ with my dad right now,” Valastro said in an Instagram post mourning loss of mother Mary. We are truly sorry for the family’s loss. Mary’s only son – Buddy Valastro (Bartolo Valastro), was born in Hoboken in 1977. He is an actor and producer, known for Cake Boss, Kitchen Boss and Rachael Ray. He is married to Lisa Valastro since 2001. They have four children. Buddy Mary’s son started Mama Mary Foundation after his mom’s diagnosis. The foundation has a huge outreach and support. The foundation gives back to those in need, strives to create awareness about this disease and to raise funds to find a cure. God bless you and your family my wife also has ALS its been very heartbreaking for myself and family I cry every day thinking about losing her after 45 years of marriage I try to keep her strong do a lot of praying. Heartfelt condolences across the sea..from South Africa..Thinking of you all! Dear Buddy & Family How sad it was too see the heartbraken of sweet Mary . It broke my heart. All my Prayers too each one of you. Mary is in a save place in Jeovah God’s hands now. I’m truely sorry. God bless you Mary and buddy Valatro, you have been a support for your family. MY sincere prayers and thoughts are with you and the Valastro family. My mom died in 2012 from ALS. I know exactly what you guys are going through. It was heartbreaking and frustrating to know how this horrible disease took everything. She was in bed unable to move for 2 1/2 years, until one day she got a cold that turned to pneumonia and after 16 days passed away. My brother in law was diagnosed with ALS in March of 2016 and passed away on October 26th 2016. ALS took my dear brother in law in 7 months. It was and still is devastating. Count your blessings that Mary is still around to loved. It is a cruel disease and I would not wish this disease on anyone. Mary you are loved and your family is wonderful. I appreciate seeing the closeness and family values setting a good example for all to see. Mama Mary, you madame are a wonderful and strong woman! You are a inspiration to me to be the best mama to my beloved daughter that i can be. She will having her first birthday this month and we are having HUGE party with our familia and friends. My Nana and I just absolutely love how close you and your familia are. Its so incredible to see and know our family isnt the only big family that has the tendency to not only yell and argue but also love each other unconditionally no matter what. God is good and we will pray for you and yours. God bless! Mama Mary, I know how it is to feel week all of a sudden when an incurable disease impair your body. Me I have two types of an incurable rheumatic disease which are influencing my whole life. But I believe that there is always a wonder for strong people who are blessed with much of love from many people. And you are a strong woman with a wonderful family. My whole family pray for you and wishes you all the best. We love you and your whole great family! My wife and I have had you in Pray and the Hands of Jesus since we heard of your illness. We Love you, Mary. Please never forget, YOU ARE IN OUR PRAYERS. We will not forget you. You have such a Wonderful son in Buddy. Buddy, God Bless You. As a support structure for your mom, You are, as well as the rest of your family, in our prayers. Ms. Mary, You and your family embody the strong Italian work ethic and bonding. Thank you for taking public these so admirable qualities. My prayers for you to continue enjoying all you have. God bless. Mary may God bless you and your familia. You and your familia are a great inspiration. My prayers and thoughts are with you Mama Mary and family. May God hold and carry you when you need him to.